Or maybe they really are unbreakable, but the Hilux Heroes stunt driving team has no plans to trade in their utes any time soon. The HiLux Heroes have unveiled new team livery -- but it's on the same old Hilux utes. When the team was formed back in 2007 the original plan was to update the vehicles after three years. But after more than 800 performances they are still going strong. 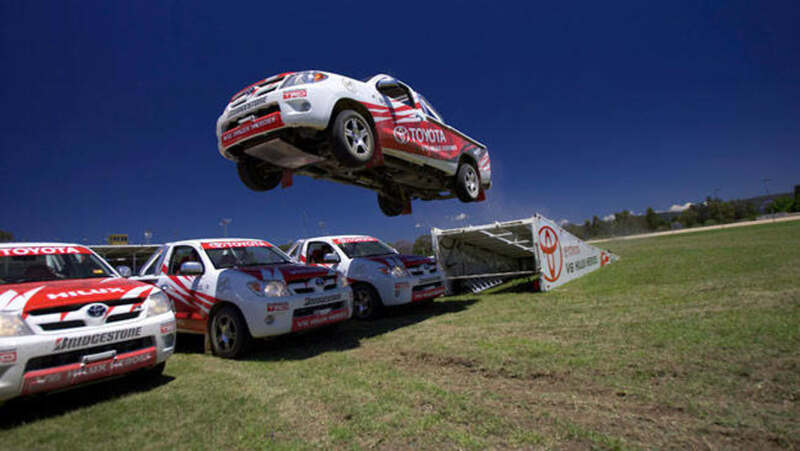 In fact, the team has been renamed the Unbreakable HiLux Heroes for 2012 in a tribute to the toughness of its Hilux fleet. The Toyota Hilux utes used in the performances are similar to their road going 4.0-litre V6 counterparts, with heavy duty suspension for 15-metre ramp jumps and locking differentials for extended driving on two wheels the only major mechanical modifications. Lead driver Jack Monkhouse said he was amazed at how much punishment these cars have absorbed. "We've tortured them with thousands of jumps, bumps, skids and slides and yet they never miss a beat. "When we started the plan was to replace them after three years, but they are so tough they are now in their fifth year and are still as strong as ever."